Are you riding on the wave of technology? 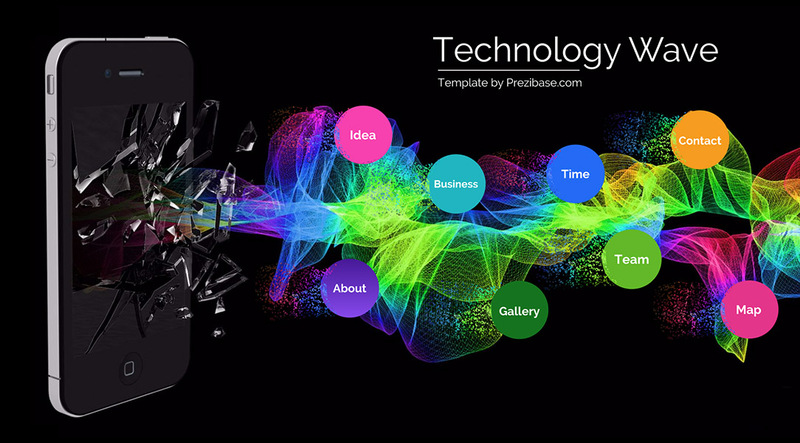 A creative 3D Prezi next presentation template with a broken smartphone screen and a colorful wave. 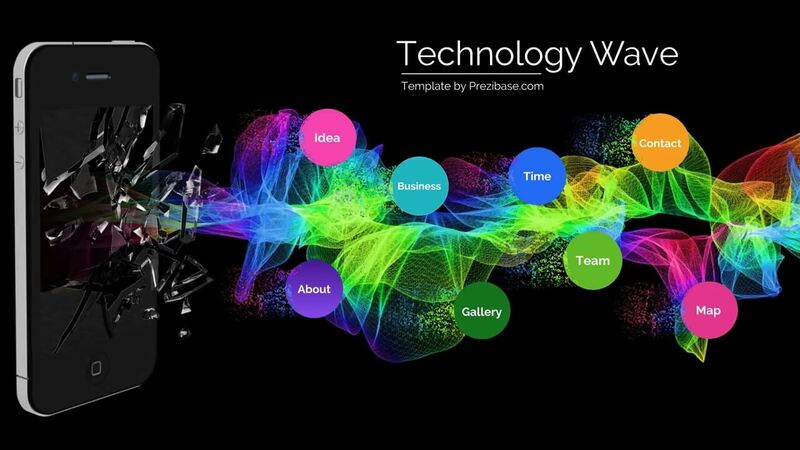 Prezi Next Presentation Template for a technology or internet related presentation.How does the technology transform our lives? What will the future bring. Answer these questions in your Presentation and talk about mobile revolution. Mobile technology is taking over the world! Don’t believe me? According to statistics, 51.89% of overall web traffic is originated from mobile devices and it has doubled in just a few years! Whether you like it or not mobile screens and people browsing content on their iPhones is the current trend. So here’s a presentation template for a modern topic – A black iPhone with a broken screen and a wave of colorful light flying out of the screen. A great concept to illustrate the mobile revolution and data flow. Use this presentation template for talking about a mobile application or the popular trend of mobile devices worldwide. If you look at what smartphones can do nowadays, then this template can be used for almost any topic… just kidding, it’s not good for making a presentation about dogs, unless it’s a mobile app for dogs doing selfies? It’s a real thing trust me! The template starts with an overview of a standing black iPhone and a light wave bursting out of the screen. Although I guess the explanation that a colorful lightwave cracked the iPhone screen is not a very a common one. Advance your presentation by zooming into the colorful circle topics. Add your own headlines into the circles and easily change the color and size of each object. The template includes many example slides which are filled with demo content. These include an introduction slide, a content slide with text and images, timeline element, business bar graph, portfolio and gallery slide, vector world map, and a contact page. All adjustable slides – easily edit the content, text and colors and of course add as many more slides and topics as you need. 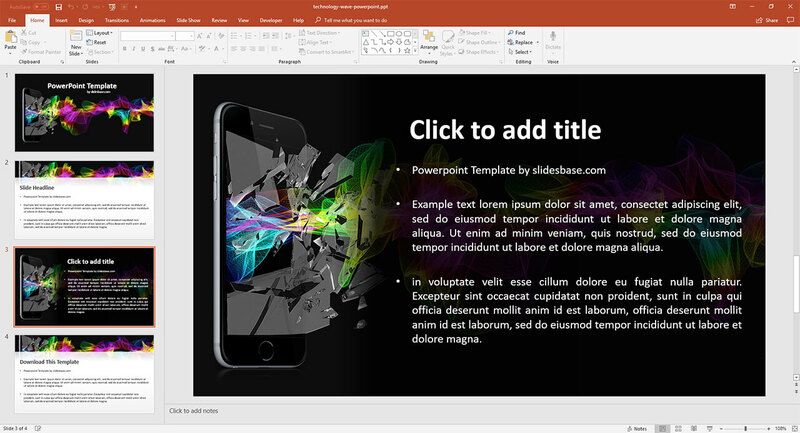 A PowerPoint PPT version of the Mobile Technology Wave template is also included in the purchase. The PowerPoint version includes 2 alternative slide layouts with white and dark background colors. A creative concept for presenting about mobile technologies. So don’t crack your iPhone screen, use this template instead! This entry was posted in Best Prezi presentation templates, Prezi Next Templates and tagged abstract, AI, black iphone, broken iphone screen, colorful, creative iphone presentation template, creative technology presentation, IOS app, IOT, iphone, iphone application, mobile, mobile app powerpoint presentation template, mobile app presentation, mobile application presentation templates, mobile presentation templates, powerpoint mobile phone template, presentation templates for mobile apps, prezi next template, prezi next templates, smartphones, t mobile powerpoint template, technology, technology wave presentation, technology wave prezi template, wave.